Get outdoors at Hon Chong and Scuba & Snorkeling. Discover out-of-the-way places like Thermal Spas and Canyoning & Rappelling Tours. There's lots more to do: take in the natural beauty of i resort, take in the spiritual surroundings of Long Son Pagoda, snap pictures at Tran Phu Bridge, and soothe aching muscles at some of the top local wellness centers. For maps, traveler tips, ratings, and tourist information, read Nha Trang itinerary builder. Portland, USA to Nha Trang is an approximately 34-hour flight. The time zone changes from Eastern Standard Time to Indochina Time, which is usually a 12 hour difference. Expect a bit warmer temperatures when traveling from Portland in July; daily highs in Nha Trang reach 95°F and lows reach 80°F. Wrap up your sightseeing on the 17th (Mon) early enough to travel to Hoi An. Start off your visit on the 17th (Mon): see some colorful creatures with a scuba or snorkeling tour. On your second day here, kick back and relax at My Khe Beach, then enjoy the sand and surf at Non Nuoc Beach, and then enjoy the sand and surf at Cua Dai Beach. 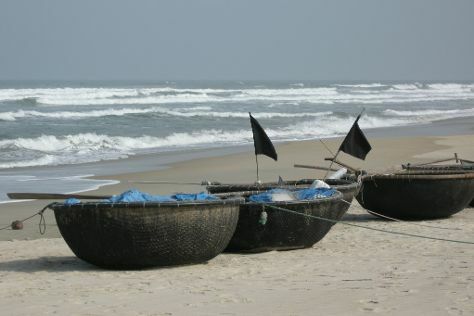 To see reviews and other tourist information, you can read our Hoi An trip planner. Getting from Nha Trang to Hoi An by combination of shuttle, flight, and taxi takes about 3 hours. Other options: drive; or do a combination of train and bus. Expect a daytime high around 93°F in July, and nighttime lows around 78°F. Finish your sightseeing early on the 19th (Wed) to allow enough time to drive to Hue. 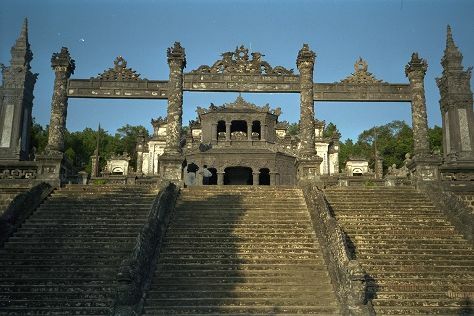 Start off your visit on the 19th (Wed): steep yourself in history at Tomb of Tu Duc, then explore the ancient world of Royal Tombs, then steep yourself in history at Tomb of Minh Mang, and finally contemplate the long history of Imperial Tomb of Dong Khanh. Get ready for a full day of sightseeing on the 20th (Thu): contemplate the long history of Hue Imperial City (The Citadel), steep yourself in history at Nine Dynastic Urns, then contemplate the waterfront views at Perfume River, and finally admire the masterpieces at Le Ba Dang Art Museum. To see maps, where to stay, other places to visit, and tourist information, go to the Hue vacation trip planner. Traveling by car from Hoi An to Hue takes 2 hours. Alternatively, you can do a combination of bus and train; or take a bus. In July, daily temperatures in Hue can reach 93°F, while at night they dip to 76°F. Finish your sightseeing early on the 20th (Thu) so you can travel back home.